DANCE PICTURES: BOOK YOUR PHOTO SHOOT!! 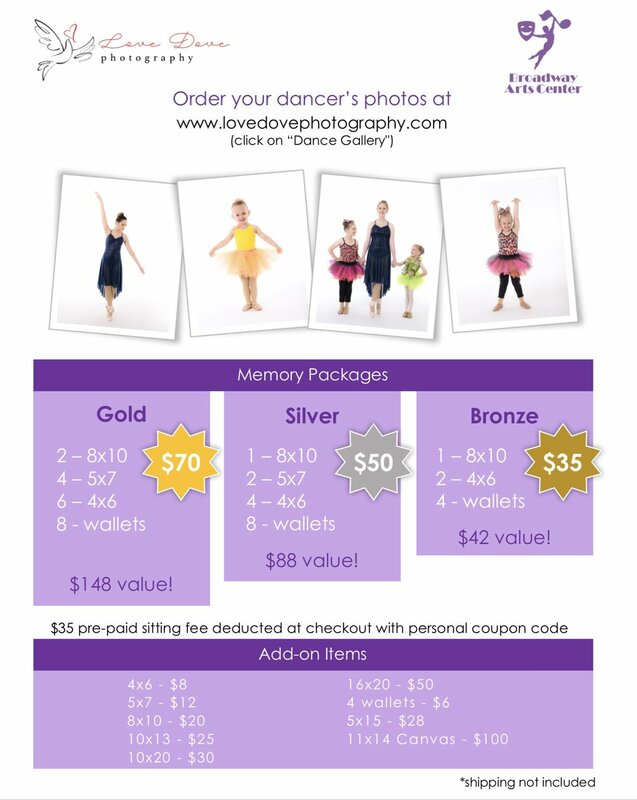 LOVE DOVE PHOTOGRAPHY will be at BAC on MAY 11 & 12 for DANCE PORTRAITS! BY APPOINTMENT - LIMITED SPOTS AVAILABLE!!! Scroll Down for Samples from last Years Shoot!! Receive A $35 Coupon Code At Your Appointment To Use Towards Your Prints. This Code Can Be Used For Single Prints Or Packages. It Can Also Be Used Towards Pictures Taken Onstage From Dress Rehearsal. If You Book More Than One Session You Will Receive A $35 Coupon Code For Each Sitting Fee. Be On Time! Arrive “Camera Ready” At Least 10 Min Early To Allow Time To Park And Get Settled. Appointments Run Every 1O Min -. If You Are Not There When Your Appointment Is Called We Will Move On To The Next Person And Fit You In Later. Be Ready! Have Hair, Make Up, Costume, Etc Complete By The Start Of Your Session So You Are Not Wasting Any Of Your Session Time With Primping. Poses! BAC Staff Will Be There To Help Pose Dancers. Older/Experienced Dancers Are Encouraged To Come With Their Own Pose Ideas - Please Practice The Pose Ahead Of Time And Be Sure You Can Perform It Confidently, Quickly And Correctly. BAC Reserved The Right To Decline Poses If They Feel They Are Unsafe Or If They Do Not Well Represent The Dancer, The Studio Or Proper Technique. SITTING FEES: A $35 Sitting Fee Is Required To Book The Appointment. You Will Receive A $35 Coupon Code When You Come To Your Session To Be Used Online Towards Purchasing Your Prints. Sitting Fees Are Non-Refundable And Non-Transferable. COUPON CODES: “USE OR LOSE” All Coupon Codes Must Be Used By Their Expiration Date. Expired / Unused Coupon Codes Cannot Be Refunded And Cannot Be Used Towards Future Years Pictures. Unused Codes From Last Year Cannot Be Used Towards This Year’s Pictures. Coupon Codes Can Only Be Redeemed On The Photography Website. CANCELLATIONS: If You Need To Cancel Your Appointment For Any Reason, Please Do So ONLINE ON THE BOOKING SITE (HERE) One Week Prior To Your Appointment. Sitting Fees Cannot Be Refunded Nor Transferred To Another Family. However, Cancellations Made By May 5, 2018 Will Receive A Coupon Code Which Can Be Used Towards Pictures Taken On Stage At Dress Rehearsal.